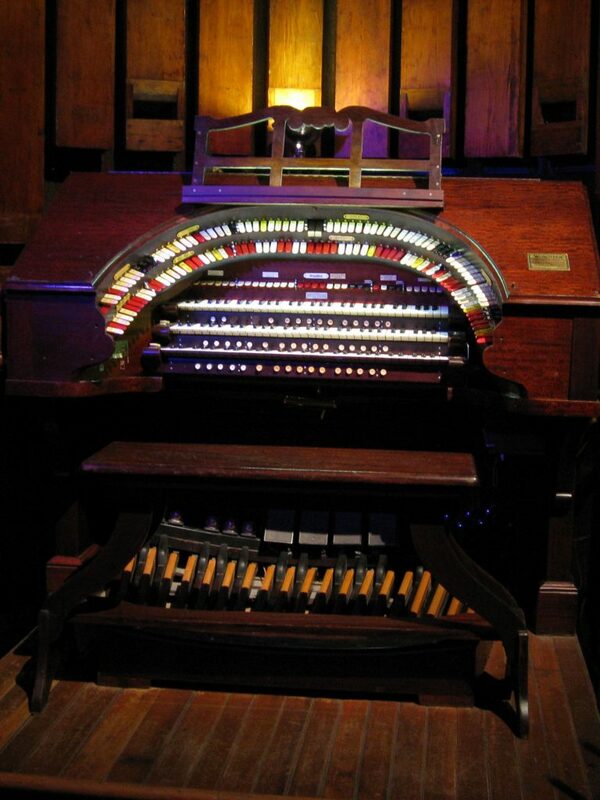 The City Museum Organ is designed as a theatre organ, which means it has the sound resources to provide music for movies made in the 1920’s that had no sound track. The St. Louis Theatre Organ Society (SLTOS) installed this instrument to help preserve this unique art form. The idea for an organ in this space was presented to Mr. Bob Cassilly, the creator of the City Museum. He accepted and provided SLTOS assistance to construct the organ with musical parts provided by SLTOS. The museum workers used their expertise and materials to construct what you see in the style of the museum. For instance, look at the door of the organ loft. You see a musical treble clef welded in the door as a decoration. The organ itself in comprised of pieces and parts from several organs that SLTOS had in storage. The console (the keyboard structure) was from a Wurlitzer theatre organ in New York Times Square (The Rivoli) that was removed in the 1960’s when the theatre was renovated. Other parts came from theatre organs in the St. Louis area and beyond. It has the traditional theatre organ sound to fill the “Enchanted Caves” with great music. All the sounds are natural either blown or struck – no speakers. The organ can be played from the console or by the computer relay which has over 600 songs in its memory. Console: 3 manual keyboards 61 keys; pedal board 32 keys; 139 stops; several other buttons and keys. Pipes: 1,218 pipes in 18 ranks: Brass Trumpet, Post Horn, Horn Diapason, Tuba, Brass Saxophone, Tibia, Orchestral Oboe, Krumet, Open Diapason, Concert Flute, Salicional, Vox Humana, Gamba, Gamba Celeste, Clarinet, Violin, Violin Celeste, Metal Saxophone. Tuned Percussions: 249 notes: Xylophone, Chrysoglott, Glockenspiel, Chimes, Piano. Effects: Bass Drum, Snare Drum, Cymbal, Tap Cymbal, Wood Block, Tambourine, Castanets, Triangle, Gong, Train Whistle, Door Bell, Siren, Fire Gong, Horse Hooves. If you are interested in more information about the organ or SLTOS, please click the about us tab above.